Upper aerodigestive space (UAS) is a common passage to the alimentary and respiratory system. It extends superiorly from the cranial base to inferiorly at the level of the inferior border of C6 vertebrae. The various organs within the UAS have many functions such as facilitating ventilation, lower airway protection, phonation, and deglutition. Skeletal pattern variation causes alteration in the soft tissue resultingin obstructive sleep apnea (OSA). OSA is an increasingly prevalent disease with a disabling condition characterized by disruptive snoring. Repeated episodes of complete or partial obstructive in the UAS resulting in nocturnal hypoxemia, frequent arousal, excessive day time sleepiness, irritability, memory problems, and diminished quality of life. Untreated OSA leads to systemic oxyhemoglobin desaturation due to apnea that results in increased oxidative stress on many physiological systems contributing to systemic disease. Patients with OSA are at a greater risk of developing cardiovascular disease, insulin resistance, and metabolic syndrome. It is mandatory to perform physical examination and various imaging methods to know the exact pathogenesis there by preventing from complications. This review is to highlight all the UAS evaluation methods that include physical examination as well as various imaging methods that can be done in both awake and asleep patients. Subjective assessment is done using Epworth sleepiness scale  and Stanford sleepiness scale, in which the frequency of falling asleep is rated by the patient on a sleep scale. Objective assessment is done in the sleep clinic by Multiple Sleep Latency Test (MSLT) formulated in 1977. It is used to measure the sleep latency during sleep deprivation procedure where patient is made to rest on the bed for every 2 hours during the wake period and the asked to fall asleep. Each test is terminated every 20 minutes when the patient does not sleep, but if the patient sleeps it is terminated after 1 minute of stage 1 sleep. The MSL is 12.8 ± 4.1 for normal patients and 7.2 ± 6.0 for OSA patients. Most authors stated that this method is difficult to differentiate from severe sleep conditions. Multiple wake test (MWT) was developed in 1982 to overcome MSLT. It is used to measure the ability of the patient to stay awake. During this procedure, the patient is asked to sit in a chair in a dimly lit room with the instruction to stay awake. Each trial is terminated after 20 minutes if the patient did not fall asleep. Visual examination begins with assessment of nasal cavity by anterior rhinoscopy. The patient is seated with the head tilted back which facilitates visualization nasal septal deviation, turbinate hypertrophy, nasal polyps, and other masses. Oral cavity and pharyngeal space is examined by Mallampatti test, in which pharyngeal space is calculated by correlating tongue and uvula size. This will allow visualizing peritonsillar narrowing, macroglossia, elongated or enlarged uvula, tonsillar hypertrophy, and high arched or narrow arched palate. Obesity increases the severity of OSA. Studies by Friedman et al. and Zonato et al. correlated modified Mallampatti test, BMI and tonsillar size which predicted the severity of OSA. BMI is calculated along with the neck and waist circumference to measure the obesity and central fat deposition. Increase in neck circumference can result in narrowing of the UAS causing obstruction. Polysomnography is a multiparametric test used to record biophysical changes that occur during sleep. It is done with various parameters such as electroencephalogram (EEG), electrooculogram (EOG), and intercoastal/diaphragmatic electromyogram (EMG). With additional parameters such as electrocardiography (ECG), calibrated/uncalibrated inductance plethysmography is used to differentiate between abdominal and thoracic movements. Esophageal manometry is used to determine oxygen saturation. Pulse oximetry and capnography is done to find the oxygen and carbon dioxide levels in the blood and tissue. AHI (apnea-hypopnea) index is obtained using PSG which is used to measure the severity of OSA. 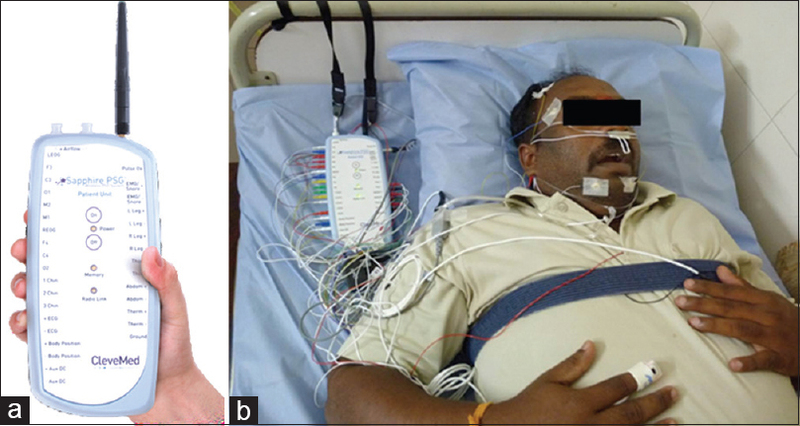 PSG parameters connected to the PSG meter is shown in [Figure 1]., The use of polysomnography is limited due to differences in interobserver scoring, sleep position, alcohol consumption, and nasal congestion. Continuous positive airway pressure (CPAP) is an advanced treatment modality for OSA. Prior to CPAP therapy, for every patient CPAP titration is done to measure the amount of pressure needed for the treatment. It is done by placing a mask covering the nose and mouth and monitoring the nasal pressure. When the nasal pressure is below Pcrit (maximum inspiratory air during sleep), there is no fluctuation seen in the mask, when the nasal pressure is raised in 1–2 cm H2O increments during stage 2 sleep, fluctuation is seen in the mask pressure. Pcrit is obtained between the last nasal pressures at which there is no fluctuation in the mask to the first nasal pressure at which the fluctuation begins. It is based on the relationship between pressure and flow through the collapsible tube. The readings are classified into (1) Pcrit ≤10 cm H2O are normal breathing, (2) −10 to − 5 cm H2O are snoring, (3) −5 to 0 cm H2O are obstructive hypopnea, and (4) >0 cm H2O are obstructive apnea. CPAP treatment is contraindicated in patients who have chronic sinusitis, chronic obstructive pulmonary disease, and for those patients who need more than 20 cm H20 of pressure as it can cause difficulty in expiration. Surgical treatment is planned in patients who are contraindicated to CPAP for which various imaging methods can be used to assess the level of obstruction. It is a noninvasive procedure based on the reflection of sound waves. The acoustic signal is emitted from the device pharyngometry/rhinometry into the oral/nasal cavity and the amplitude and frequency of the reflected waves are recorded. It is used to assess the cross-sectional area and volume of the oral and nasal cavity through the hypopharynx by calculating the acoustic impedance. It is based on the relation Z = rC/A, where Z is the impedance (resistance), r is the density of the gas traveled by the acoustic wave, C is the velocity, and A is the diameter. The “pressure/time” recorded is converted into “cross-sectional area/distance.”, Kamal et al. reported mean pharyngeal area of 3.194 cm 2 in males and 2,814 cm 2 in females. Advantages are noninvasive, quick, accurate and inexpensive procedure. It provides three dimensional evaluation of pharyngeal airway size and volume at a given length. It also records readings in 0.2 second interval allowing for dynamic assessment of pharyngeal airway. Disadvantage being its inability to record obstruction caused due to reduced neuromuscular compensation. Separate technique is used for the assessment of oro pharynx and nasopharynx. It does not provide high resolution anatomic structure of UAS. It cannot be used during sleep. It is performed while the patient is awake using a nasopharyngoscope performing a nasopharyngoscopy- assisted Muller maneuver (NMM) method to assess the maximum value of narrowing in the pharynx. The patient is asked to do a forceful expiration followed by an inspiration with closed mouth and nose. This is done to measure the intensity of negative pressure created in the lung through nasopharyngoscope. Studies have suggested that NMM alone is not a best method to detect the pharyngeal collapse. They combined both NMM and cephalometry to predict the factor causing narrowing that helped in providing the exact treatment. Soft tissues cannot be assessed by radiographic imaging methods, hence, other imaging modalities such as direct video fluoroscopy or endoscopic procedure can be followed. Direct video fluoroscopy (DVF) is done to assess the dynamic airway anatomy and sites of obstruction in OSA patients during speech and most recently during sleep. This technique is best used in comfortable and cooperative infants, older children and adults. Toddlers and young children are difficult to manage. It is done by administering the radiopaque material (barium) mixed with liquid and food followed by imaging in 3 minutes interval. The radio image obtained can be recorder as an image or as video tapping. Advantage of this technique is the direct visualization of the obstructive site during the episode of apnea. It is limited due to high radiation dose, superimposition of the structures, need for sedation to induce sleep, only 2D image is obtained, few apneic events are recorded and need for fluoroscopy imaging. Endoscopy is the procedure in which the flexible fiber optic endoscopy is introduced through oral/ nasal cavity to assess the hypopharyngeal region. This procedure is carried out in a situation where the patient is as close to sleep as possible. These procedures are useful in identifying the soft tissue obstructions in the upper aerodigestive space. This procedure can be performed in both the adults and children. The lateral cephalogram is the most commonly used sagittal X-ray of the head and neck region. It creates a simple, economical, readily available, and reproducible way to diagnose upper airway obstruction. The cephalometric image obtained in a Frankfort horizontal Plane parallel to the floor reveals various hard and soft tissue changes that may indicate the pathophysiology of the OSA. Radiopaque dye IOHEX can be used to highlight the soft tissue outline for better analysis. 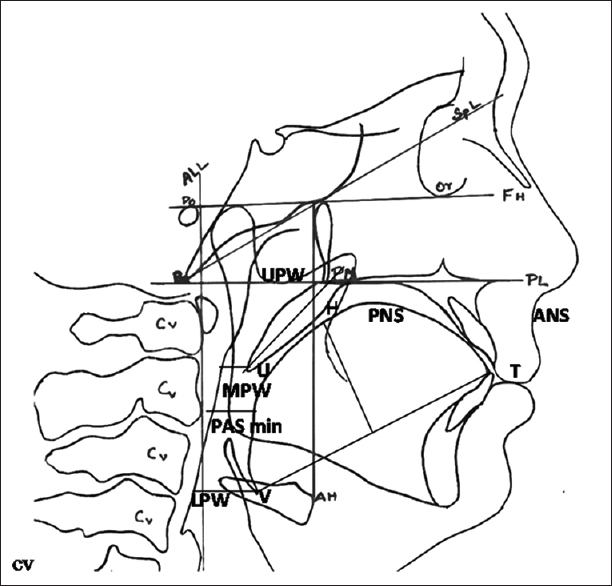 Cephalometric image will be traced on the acetate paper and various linear measurements and area measurements are obtained., The specific cephalometric variables that can predict the OSA are posteriorly placed mandible, narrow posterior airway space (upper pharyngeal wall (UPW), middle pharyngeal wall (MPW) and lower pharyngeal wall (LPW), enlarged tongue [maximum height at the mid-point between vallecula and tongue (VT)] and the soft palate [posterior nasal spine (PNS)-U is tip of the uvula], and inferiorly positioned hyoid bone [anterosuperior point of hyoid bone (AH) – tongue tip (T)], as shown in [Figure 2]. Many research groups have stated that certain anatomical variables were more common in the OSA patients and also predicted the severity of this condition.,,,, Riley et al. found that a PAS min (posterior airway space minimum) less than 11 mm was a risk factor for OSA Various measurements used in prediction of severity of OSA is given in [Table 1]. Upper aerodigestive tract is a three-dimensional (3D) structure, and hence, an imaging modality that provides three-dimensional analysis becomes necessary to evaluate the pharyngeal obstruction. CT provides precise pharyngeal measurements using axial slices at multiple levels. This imaging is done in an awake patient in the supine position. 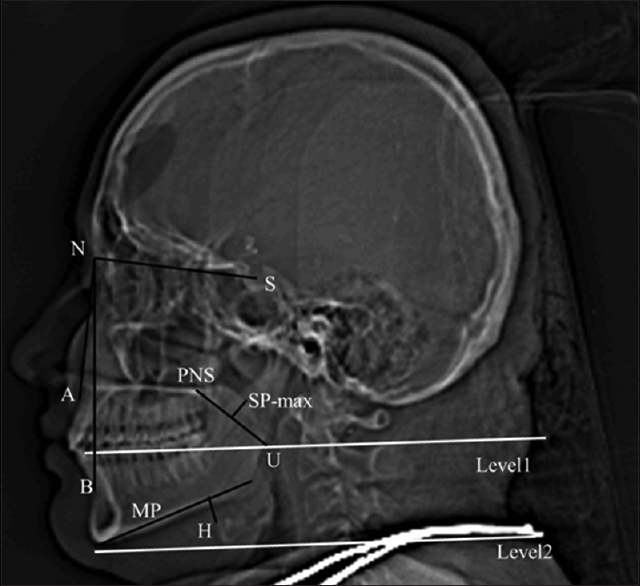 Axial scans are planned with 3-mm slice thickness, parallel to the infraorbital meatal line and covering the entire region from the external auditory meatus to the upper border of the manubrium sterni, as shown in [Figure 3]. Table 2: Measurements to calculate size of aerodigestive space according to abramson et al. The corresponding cross-sectional area is calculated in the maximal inspiration and expiration while the patient is breathing spontaneously. The dynamic CT was obtained by imaging the patient during maximum inspiration and expiration. Decrease in the pharyngeal airway space in the maximum inspiratory phase both in control and OSAS patients. Yucel et al. found that narrowing at the level of uvula in the expiration can be considered as a key point in measuring the severity of OSAS; they also found a positive correlation between the neck circumference, soft palate thickness of 10.0 ± 2.0 mm, SP length of 35.0 ± 3.6 mm, and MP-H distance of 15 ± 5.7 mm. Avrahami et al. suggested that the narrowest cross-sectional area of the oropharynx during quite tidal breathing should be 50 mm 2 and predicted the severe OSAS. Pipin et al. 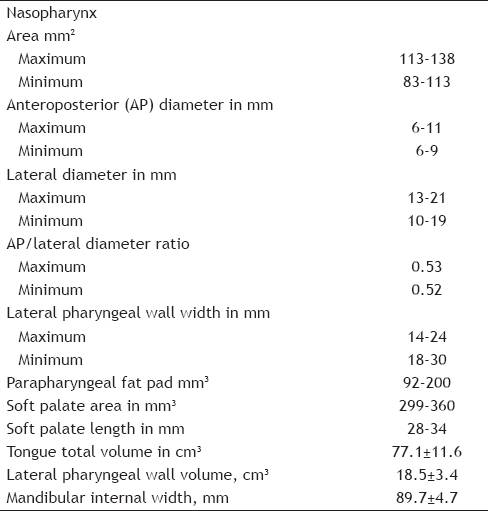 hypothesized that “S”-shaped soft palate causing a sudden and major reduction in the oropharyngeal dimension, which is an indication of a high risk factor in OSAS [Table 2]. Advantage of CT is allowing volumetric assessment of airway and improved soft tissue contrast than cephalometry. Quick scanning also enables a dynamic evaluation of the airway. Disadvantages of this technique are relatively costly, inability to image the entire airway in a single plane, exposure time and the higher radiation dose. CBCT was introduced in evaluation of upper airway to minimize the radiation dose delivered by the CT imaging. Using the larger field of view protocol the entire UAS is visible thus CBCT becomes a very useful tool in evaluation of air way. In CBCT analysis, according to Tomonori / Wasaki et al., the pharyngeal space is divided into 3 groups based on which the size and volume varies. Wide, square and long are the three different shapes of which the size and volume decreases from wide, long and square respectively as shown in [Figure 5]a, [Figure 5]b, [Figure 5]c. The limitations of CBCT were only the hard tissues are evaluated and the procedure is carried out clinically in the upright position making it difficult to obtain the accurate measurement in the anteroposterior distance. To overcome this difficulty; assessing the volumetric and dimensional difference between the normal and the OSAS patients becomes mandatory. The normal distance between posterior nasal spine to posterior pharyngeal wall (PPW) is 31.50mm, tip of the soft palate to the PPW is 15.20mm, tip of epiglottis to the PPW is 16.60mm, base of the tongue to the PPW is 22.30mm, anterior point of the base of C2 to anterior pharyngeal wall is 6.40mm, retrognathion to C2 is 79.10mm, length of the soft palate is 47.60mm, length of the tongue is 83.10mm, intermaxillary space distance is 84.80mm and the angle between nasopharyngeal and oropharyngeal airway space is 113.0 degree. UAS is composed of skeletal and soft tissue complex which makes it necessary to evaluate both hard and soft tissue components. MRI is a noninvasive, nonionizing radiation that provides a better understanding of the upper airway anatomy and function. The axial section obtained at the level of the maximal tonsillar cross-sectional area determines the cross-sectional area of the oropharynx, tonsils, pterygoids, airway cross-section, and parapharyngeal fat pads. Linear measurements are made along the transverse line crossing the center of the tonsils such as intertonsillar width, bilateral tonsillar width, bilateral fat pad width, bilateral pterygoid width, and intermandibular distance, as shown in [Table 4]. Table 4: Airway and soft tissue dimension of healthy adults in mri according to ciscar et al. Some authors have stated that the severity of the OSAS depends on the amount of the fat deposited, while others considered pharyngeal muscle hypertrophy/enlargement of the nonadipose tissue led to obstruction in the upper airway. According to Schwab et al., the lateral pharyngeal wall thickness rather than enlargement of the parapharyngeal fat pads was the predominant factor causing constriction in OSAS. Ryan et al. in his study with MRI found that narrowing of the upper airway was predominantly due to local edema and inflammation. Recently, 3D assessment of upper airway using MRI seems to be accurate. The increase in the volume of the tongue, soft palate, and the lateral wall of the pharynx had been correlated to the severity of OSA. Dynamic MRI can also be used to evaluate any obstruction in the upper airway. Changes in the upper airway is monitored in the spontaneous sleep during which significant obstruction at various level occurs. Diagnosis of patients with sleep disturbance is a complex procedure done by various sleep scales and multiple test. Obstruction in the UAS is evaluated by various imaging methods such as acoustic reflection, nasopharyngoscope, endoscope, direct videofluroscope, lateral cephalometry, CT, CBCT, MRI, ultrasonography, and OCT. No single aerodigestive space analysis can provide a high index of sensitivity and specificity for the prediction of difficulty in the upper aerodigestive tract. Therefore, a combination of multiple tests is required to assess the patients with the experienced team by a panel of physicians include general physician, geriatrician, sleep specialist, ENT, neurologist, psychiatrics or other mental health professionals, dentists, radiologists, and surgeons. Sheng CM, Lin LH, Su Y, Tsai HH. Developmental changes in pharyngeal airway depth and hyoid bone position from childhood to young adulthood. Angle Orthod 2009;79:484-90. Sharafkhaneh A, Giray N, Richardson P, Young T, Hirshkowitz M. Association of psychiatric disorders and sleep apnea in a cohort. Sleep 2005;28:1405-11. Rasmusson L, Bidarian A, Sennerby L, Scott G. Pathophysiology and Treatment Options in Obstructive Sleep Apnoea: A Review of the Literature. Int J Clin Med 2012;3:473-84. Gupta S, Sharma R, Jain D. Airway Assessment: Predictors of Difficult Airway. Indian J Anaesth 2005;49:257-62. Nam H, Lim JS, Kim JS, Lee KJ, Koo DL, Lee C. Sleep perception in obstructive sleep apnea: A study using polysomnography and the multiple sleep latency test. J Clin Neurol 2016;12:230-5. Arand D, Bonnet M, Hurwitz T, Mitler M, Rosa R, Sangal RB. The Clinical Use of the MSLT and MWT. Sleep 2005;28:123-44. Maclean AW, Fekken GC, Saskin P, Knowles JB. Psychological evaluation of the Stanford sleepiness scale. J Sleep Res 1992;1:35-9. Togeiro SM, Chaves Jr CM, Palombini L, Tufik S, Hora F, Nery LE. Evaluation of the upper airway in obstructive sleep apnoea. Indian J M Res 2010;131:230-5. Chesson AL Jr, Ferber RA, Fry JM, Grigg-Damberger M, Hartse KM, Hurwitz TD, et al. Practice Parameters for the Indications for Polysomnography and Related Procedures. Sleep 2005;28:499-519. Viviano JS. Acoustic reflection: Review and clinical application for sleep disorder breathing. Sleep Breathing 2002;6:129-49. Kumar S, Jayan B, Bansal AK. Acoustic pharyngometry: An objective assessment tool for determining pharyngeal airway. J Dent Specialities 2015;3:102-8. Rugiu MG. Role of videofluoroscopy in evaluation of neurologic dysphagia. Acta Otorhinolaryngol Ital 2007;27:306-16. Mehta S, Lodha S, Valiathan A, Urala A. Mandibular morphology and pharyngeal airway space: A cephalometric study. APOS Trends Orthod 2015;5:22-8. Grewal N, Godhane AV. Lateral cephalometry: A simple and economical clinical guide for assessment of nasopharyngeal free airway space in mouth breathers. Contemp Clin Dent 2010;1:66-9. Samman N, Mohammadi H, Xia J. Cephalomatric norms for the upper airway in a healthy Hong Kong Chinese population. Hong Kong Med J 2003;9:25-30. Al-Sayagh NM. A cephalometric comparison of pharynx and soft palate in Iraqi adolescents and adults population. Al-Rafidain Dent J 2012;12:32-42. Vilella OD, Vilella BS, Karsten A, Ianni Filho D, Monteiro AA, Koch HA, et al. Evaluation of the nasopharyngeal free airway space based on lateral cephalometric radiographs and endoscopy. Orthodontics 2004;1:215-25. Nguyen MT, Visuttiwattanakorn S, Truong DM, Wongsirichat N. Effects of orthognathic surgery on pharyngeal Airway space: A Literature Review. Mahidol Dent J 2014;34:165-73. Gu M, McGrath CP, Wong RW, Hägg U, Yang Y. Cephalometric norms for the upper airway of 12-year-old Chinese children. Head Face Med 2014;10:38. Kaur S, Rai S, Kaur M. Comparison of reliability of lateral cephalogram for assessment of airway space. Niger J Clin Pract 2014;17:629-36. Abramson Z, Susarla SM, Lawler M, Bouchard C, Troulis M, Kaban LB. Three- dimensional computed tomographic airway analysis of patients with obstructive sleep apnea treated by Maxillomandibular advancement. J Oral Maxillofac Surg 2011;69:677-86. Yucel A, Unlu M, Haktanir A, Acar M, Fidan F. Evaluation of the upper airway cross- sectional area changes in different degrees of severity of obstructive sleep apnea syndrome: Cephalometric and Dynamic CT study. AJNR Am J Neuroradiol 2005;26:2624-9. Iwasaki T, Hayasaki H, Takemoto Y, Kanomi R, Yamasaki Y. Oropharyngeal airway in children with class III malocclusion evaluated by cone-beam computed tomography. Am J Orthod Dentofacial Orthop 2009;136:318.e1-318.e9. Uong EC, McDonough JM, Tayag-Kier CE, Zhao H, Haselgrove J, Mahboubi S, et al. Magnetic Resonance Imaging of the upper airway in children with Down Syndrome. Am J Respir Crit Care Med 2001;163:731-6. Ciscar MA, Juan G, Martínez V, Ramón M, Lloret T, Mínguez J, et al. Magnetic resonance imaging of the pharynx in OSA patients and healthy subjects. Eur Respir J 2001;17:79-86. Kundra P, Mishra SK, Ramesh A. Ultrasound of the airway. Indian J Anaesth 2011;55:456-62. Armstrong J, Leigh M, Walton I, Zvyagin A, Alexandrov S, Schwer S, et al. In vivo size and shape measurement of the human upper airway using endoscopic long-range optical coherence tomography. Optics Express 2003;11:1817-26.